Once again this year, Apple is celebrating the holiday season with a 90-second, unconventional television spot showcasing how its products can be used to create thoughtful gifts that can strengthen relationships with others. 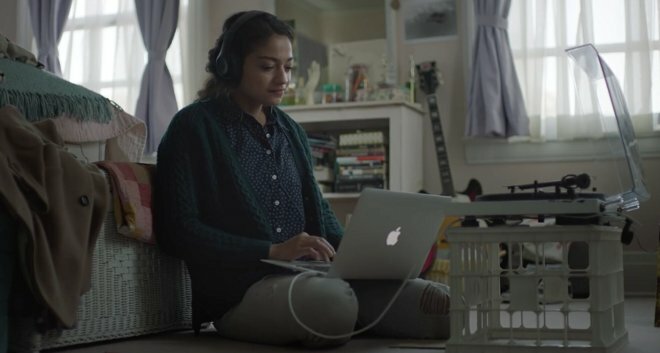 The new ad, called "The Song," shows a younger woman using her Apple devices to record a duet with an old recording her grandmother made for her grandfather. The ad shows her using a MacBook, and iPhone and an iPad over some time to perfect the holiday gift. The grandmother listens to her present Christmas morning saved on an iPad mini 3. As she is brought to tears by the composition, the granddaughter watches with a smile from a distance. "With a Mac, iPhone or iPad you have the power to create thoughtful, emotional gifts and memories that transcend time," the ad's description reads. "It could be a movie, a homemade card or a song that brings two generations closer together." Apple's short film for the 2014 holiday is the second straight year that the company has made a longer advertisement telling a singular story for the Christmas season. Last year's creation, "Misunderstood," featured a boy staring at his iPhone during a family gathering, only to eventually reveal he had been editing together a movie to show to everyone. The 2013 ad won a Creative Arts Emmy for "Outstanding Commercial." Over the years, Apple's ads have earned a reputation for being at times emotional, funny, eye catching, and most of all iconic, ranging from the heralded "1984" Super Bowl spot to the "Get a Mac" campaign that featured physical embodiments of a Mac and a Windows PC.